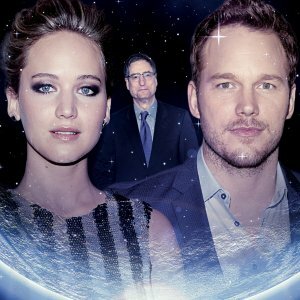 If you’re not sure why, look no further than this article on Jennifer Lawrence’s upcoming project, Passengers. And we just need Jen in a movie with Chris Pratt. BECAUSE. But there’s reasons why Jen should get paid the big bucks, especially for this film: She is perhaps the most bankable young female actress in Hollywood these days. She’s proven she can carry a film and attract audiences. She got a little golden friend called Oscar. And oh, Sony screwed her over on the last film she did with them, American Hustle. In many film deals, the actors get an additional stipend based on profits. Turns out that for American Hustle, Jen got a lesser percentage than all of her male co-stars, including Jeremy Renner, whose part was smaller and less significant overall. In one of the many hacked emails, the Sony President even referred to the situation as “a joke”. BECAUSE IT IS. Some people are blaming it on Jen’s team not haggling enough to get her a better profit share, but it’s not as if they knew the men were getting a crazy-generous offer elsewhere. In fact, they could have pitched the same deal and been rejected. Either way, Sony wasn’t willing to pay Jen (or Amy Adams, it seems) as much as the boys. So we think that it’s a brilliant form of justice if they pay her the money she deserves this time around, even if it makes them uncomfortable. Passengers is still in the very early stages so lots could change, but it seems pretty clear that Sony wants and needs star power for this project, which may not be an easy sell otherwise. And it doesn’t matter than Jen is already rich, it’s a dignity thing. So they better be willing to shell it out! The salary some actors get is obscene indeed, but that is not the point in my opinion. The problem is that women are always getting less, it seems. So it is really NOT important whether an actress like Jen is already rich but that she gets the same as the men. Or more, for that matter. Why not ? Maybe some are afraid that other actresses could ask for the same … ? Agreed there. I think by the way that arguing about the actors’ salary in projects is pretty useless, seeing that they get that money because of us, and because that’s the price the studios (who actually make the big bucks, but since they are not public figures, nobody bats an eye) deem they are worth. But with the pay inequality and sexism in Hollywood it’s actually important to talk about this stuff. It’s not even just that Jennifer got paid less for American Hustle, even Amy Adams who was a lead for God’s sake, got less money than Jeremy Renner. And don’t dare to try and tell me that Renner is a bigger star than Adams because he really isn’t. The male stars demand higher payments because they know they’ll get it. The female stars are way too worried that they would be replaced if they asked for too much. Forbes releases every year a list of the Top 10 highest paid male and female actors that year, and the top 3 actresses are lucky if they could theoretically make it into their male counterparts’ list. Most years, they don’t. And the e-mails that got leaked? The amount of sexism they showed in Hollywood were truly beyond my wildest speculations. So yep, Sony better pay Jennifer that money, and if they don’t agree to the deal, I hope Jennifer feels free to just walk away from it. Because honestly, they need to learn their lesson. Of course, the media would spin it in a way to show the female star as the ‘diva’ who demanded too much, and yet nearly no one talks about the ridiculous deals and money Robert Downey Jr. demanded for those Marvel movies (they altered the whole original plot of a movie starring another Marvel actor for his sake for example, because he wanted more screentime…..). Yep, sexism isn’t just for Hollywood.